65. Spiderman is my favorite superhero. I loved the Spiderman shorts on The Electric Company as a kid (and yes, that’s Morgan Freeman as the vampire). Something about his silence is appealing and comforting. 66. I don’t like chunky peanut butter. J does. I vaguely remember losing a tooth while eating chunky PB as a kid, and I always associate the chunks with teeth. For awhile, I compromised by buying chunky ever other time. Finally, I realized that life is too short to suffer through the chunky stuff, so I buy us separate jars. 67. I hated the ending of the series finale of Battlestar Galactica. I think it should have ended about 25 minutes sooner. Sometimes less is more. 68. In my first apartment, the landlord shut off the gas line to do some maintenance and forgot to tell me or relight the pilot when he turned it back on. I grew up with an electric stove and didn’t recognize the smell as gas. Thankfully, when I got a headache, I started craving fresh air, so I went outside. The landlord’s wife saw me sitting on the step and all of a sudden it dawned on her that they didn’t relight the pilot on my stove. I think she looked worse than I felt. The color just drained from her face when she saw me. That was almost 12 years ago, but I still can’t go to bed or leave the house without checking the stove. 69. I always double knot my shoelaces. 70. In second grade, I thought it would be cool to memorize the poem Jabberwocky (you can see why I was never one of the cool kids) by Lewis Carroll. I can still recite the whole thing. I love author blogs. It’s so interesting to read about what other writers go through in their process. It’s also a great way to find new books to read. 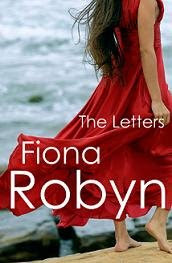 If I hadn’t stumbled across Fiona Robyn’s blog, I might have missed out on reading The Letters and missed the chance to connect with a fellow writer. That would have been a shame. As part of her blog tour, Fiona stopped by to answer some questions. 1. I love your main character in The Letters. She’s really not a people person, but she’s a very likable character. How did she come to you? In writing the book, did she evolve much from your initial ideas of her? I’m glad you thought so, Allie – not everyone has liked Violet, and I can understand that! My characters seem to appear in a vague, shadowy way – I think Violet first appeared as a lean, brusque woman in leggings and a long flapping cardigan. I do get to know them gradually – both before I start writing, by wondering what kind of music they might like or how they lost their virginity, and then during the writing process by watching what happens to them and how they respond. It’s as if she already exists somewhere, fully formed, and it’s my job to uncover her character piece by piece. I wrote my first poem at the age of twenty, and started writing novels about five years ago. I’ve been a professional reader for many more years! 3. What is your writing space like? I have a very tiny office attached to the bedroom – I can touch both walls if I stretch out my arms. I’m a minimalist and I try to keep it as empty as possible – empty rooms help me to keep my head clear. I have a snowglobe with a cat inside, a candle holder, pens and paper, and not much else. 4. Do you have any rituals associated with writing time? I light my tea-light when I start, and blow it out when I’m finished and I’m allowed to check my email! 5. Where were you when you found out your first book had sold? 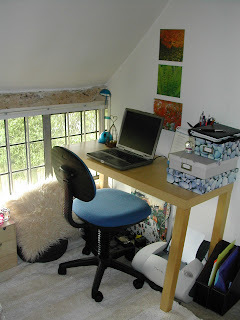 I was in bed with my lap-top – terrible habit! I couldn’t quite believe it and had to read Anna’s email about thirty times. I had known about Snowbooks for some time – I’d been attracted to their site and their philosophy – so I was over the moon. 6. Do you have any advice for writers who are just starting out? Get plenty of support (from groups, colleagues, books etc.) – writing can be lonely and disheartening if you go it alone. See publication as a long term goal, and keep writing. Enjoy it if you can! 7. You have a new book coming out. Can you tell us a little bit about it? The Blue Handbag is about Leonard, a 62 year old gardener who makes some odd discoveries about his wife after her death. Accompanied by Lily, his wife’s old school friend, he becomes a reluctant detective and tries to get to the bottom of her secrets. There are a lot of plants, a bit of Johnny Cash, and a smidgeon of Leonard’s dodgy sense of humour. I went to the library to work today. I needed to get out of the house so very badly. The dogs were driving me nuts and the walls were closing in on me, and the cat was puking in the hallway, and I just had to go. So I packed up and left. I found a yellow vinyl armchair that looked like a prop from That 70’s Show at the end of an aisle of books and sat with my headphones on, listening to my Stay playlist and editing. It was sheer bliss. Until school let out and the library flooded with kids. I started off thinking, ‘good for their parents taking them to the library after school,’ but switched over to ‘get me the hell out of here’ shortly after, when a little girl in the aisle lost interest in looking for books on pets and started farting and trying to blame it on her sister. It was almost as good as the time last summer when he saw a pile of Argo poop in our back yard and yelled out, “Who pooped in your yard?” It took everything I had not to tell him J did it.